Continuing on my foodie kick, I've got to ask: why wasn't I informed earlier about the incredible power of crescent rolls? Perhaps it's because the usual brands I see at the store aren't marked as Kosher, so I've never had a chance to pick one up. But Immaculate Crescent Rolls are marked Kosher, and so I couldn't resist picking up a can. I thought I had remembered seeing a couple of recipes that I wanted to try using them for. 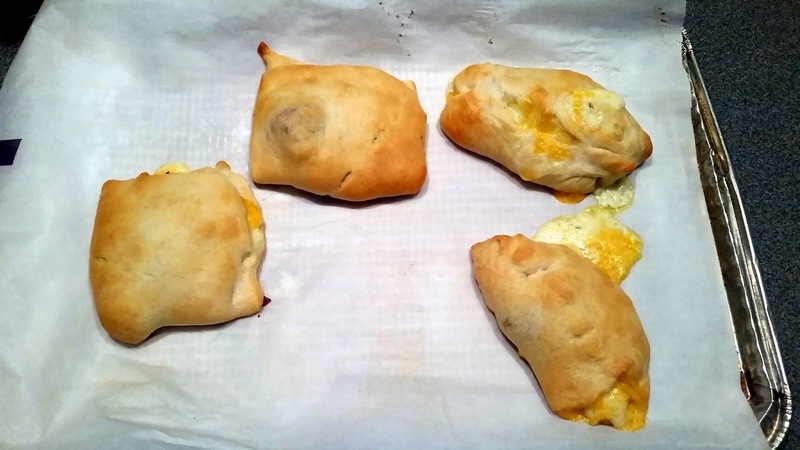 Turns out, crescent rolls are the Swiss Army knife of dough. The Internet is a buzz with listcles on the topic: 10 Super-Easy Crescent Ideas, 48 Breakfasts and Desserts using Pillsbury Crescent Rolls, 20 Delicious Recipes Using Crescent Rolls, and of course Buzzfeed's 15 Delicious Things You Can Stuff In A Crescent Roll. Best of all, many of these recipes are just a couple of ingredients. The yummy dough apparently does the heavy lifting. Now it's true, they are dairy, so that means no Pigs and Peppers in Bed (where the 'pigs' are hot dogs). But meat substitutes abound these days, so that's hardly a hurdle. And sure enough, they tasted heavenly. If I'd spent more than 2 minutes making them (and if I'd put a little egg white on the outside), they'd look much better. But in terms of taste, they are awesome. Cheese and buttery goodness, who can complain? 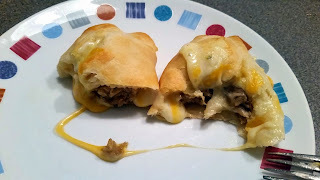 Oh crescent rolls, where have you been all my life?